Our new SHOE Chat for Lesbians offers some spanking new features. You'll love it and it's free! Probably the most exciting new feature and the most wanted is the Video Chat. See who you are chatting with. 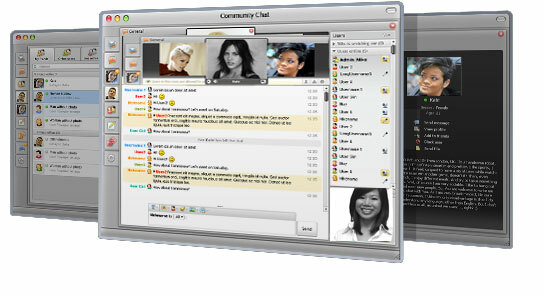 Switch on your webcam and chat with your fellow lesbian buddies from all over the world! Please note: The Video Chat Feature is only available with a membership upgrade. Upgrade today and enjoy this fantastic feature! A new feature is the possibility to chat and have other controls in separate tabs. You can join each room once and then easily switch between them using the tabs without leaving chat rooms. Also you now have separate tabs for your private conversations. This is a very immense improvement compared to the old chat, where all messages - open and private - appeared in the same room. You now have full control of who you are chatting with. Besides public chats you can create your own private room and invite other members to join private video / audio/ text chatting. It's so much fun! You may post your messages in regular text or our newly developed bubble chat mode. In this chat mode your messages are posted in bubble callouts with the color background you choose. A new type of drawing interface that's actually very easy and a lot of fun to use. Of course the new SHOE Chat for Lesbians offers lots more like: Choosing your own Avatar, Skin, Font Colors/Size and so much more! We are very excited to offer you our new Chat and hope you will have lots of memorable, fun and interesting chats there.